Dedicated, same-day, in-house computer and game console support. The best technical service available, whether your device is 10 days old, or 10 years. Ken is his name and computer repair is his game. 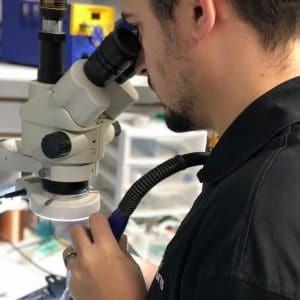 Since 2006, our in-house computer and game console technician has been working on medium-sized software and hardware alike. Along with our specialized in-house microsoldering technician, there hasn’t been a device that can stop them. Whether you’re team Mac or PC, Xbox or Playstation; our team of electronic experts has a fix for whatever problem you’re experiencing. For many of us, a computer is more than a toy. Just like your cell phone, you rely on your computer for communication, business, and entertainment. Whether you’re playing games, developing software, or sending emails, you depend on your computer to operate smoothly and efficiently. In our modern world, nearly everything is run off of a computer. They are essential for everything from typing a letter to launching a rocket ship. We understand that, and we’re here to help. That’s why we offer both laptop repair and PC repair. Repair for Any Computer Operating System. We’re all aware of the lifelong argument, “Mac vs. PC”. ​Whether you’re into Mac OS X for designing, Microsoft Windows for their flexibility, or you appreciate the ultimate freedom of Linux, Unix, or Ubuntu: Ace Communications has you covered. Our technicians are more than experienced across all operating systems from their earliest to current versions. No matter if you just updated your Macbook to OS X El Capitan, or if your desktop has more dust than RAM; we’re going to make sure it performs to your standards.